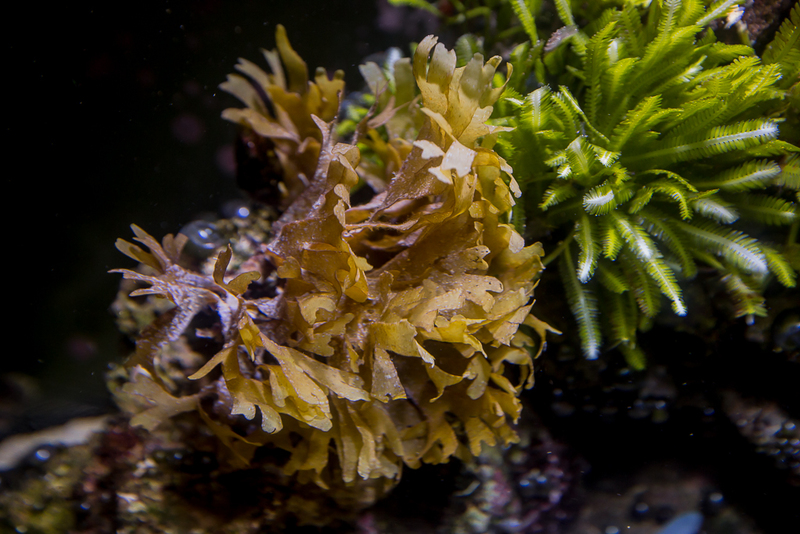 The algae has been growing well with natural light and the tank gets direct late-afternoon sun. The temperature can get as high as 31 degreeC. And light hood for night viewing was built using outdoor switch and spotlight, the tank gets about 3-hours of artificial light everyday. Love that last shot! Very cool. Thanks! You must live in a tropical place, to keep a tank outside. Love that penthouse view! 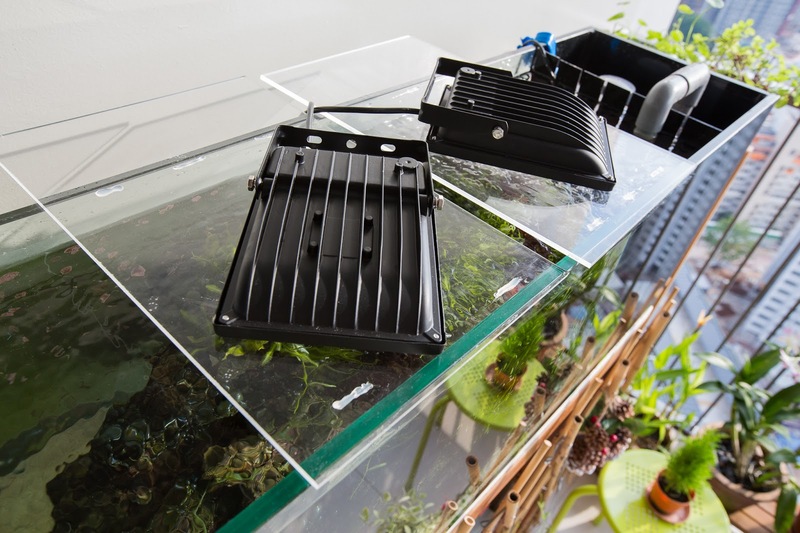 Love your aquascape design. 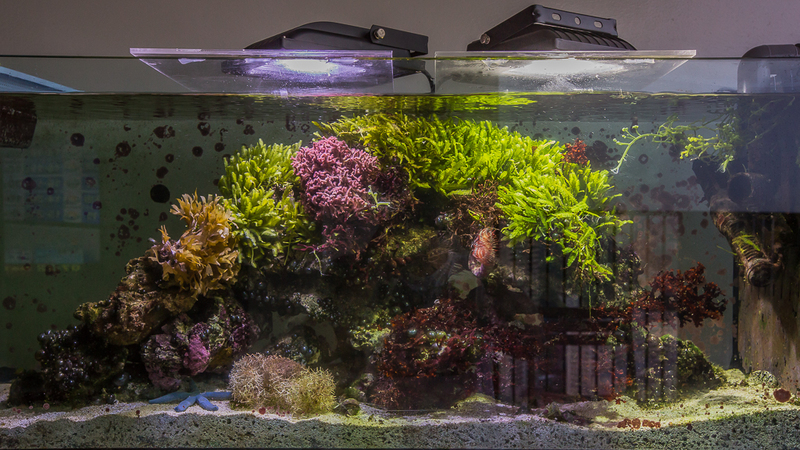 It reminds me of Walter Adey's 120g reef tank, from "Dynamic Aquaria". That single "bommie" is so much more interesting than a wall of rocks, plus it's shape is conducive to water movement. Nice. Thank you! I'm staying in Singapore, its a tropical country in the far east. 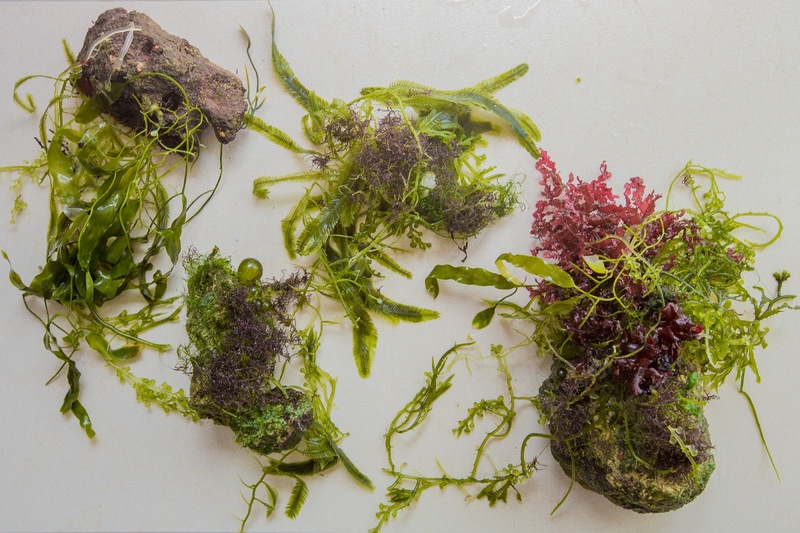 It is also surrounded by the sea and the nearest beach is at most 1-hour ride away There are pretty good diversity here, i've picked up some ribbon ulva but could never get them to hold down well in the tank Might try mangrove one day if i pick up the pods. 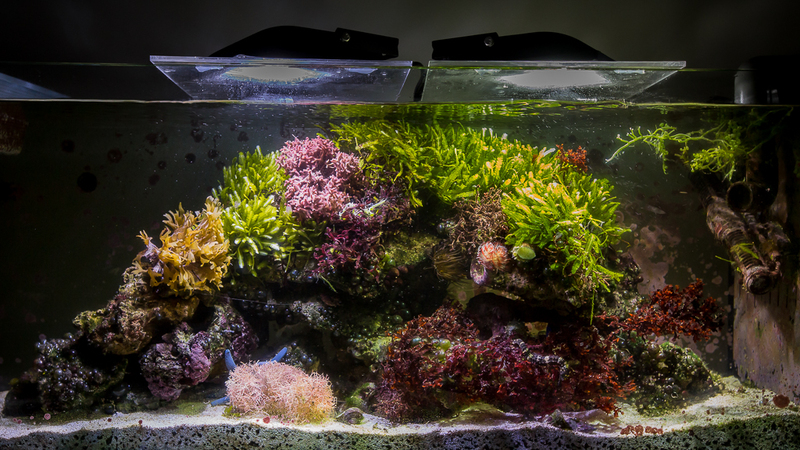 Its always summer here so the temperature is really consistent Most of the algae were bought from LFS though. Looks like "Dynamic Aquaria" is a good book i must read, Thanks! I'm really glad the habitat are dealing with the weather well, here are what i have in the display tank. I got all of my Asian mangroves from Singapore. It's a beautiful country! I love your tank by the way. Definitely unique. I don't think Ive seen anything like it! It's not too much to brag about if your fish can eat someone else's fish, but if your fish can eat somebody's dog, now thats an accomplishment! So you've got your mandarin and horse eating frozen food? That's got to make it a lot less of a hassle to keep them. Awesome! Thank you for your kind words The idea for this setup is based on the "Halophila’s Seagrass tank", really inspiring but i don't have seagrass yet so starting with macroalgae first. Great looking tank. Nice work! 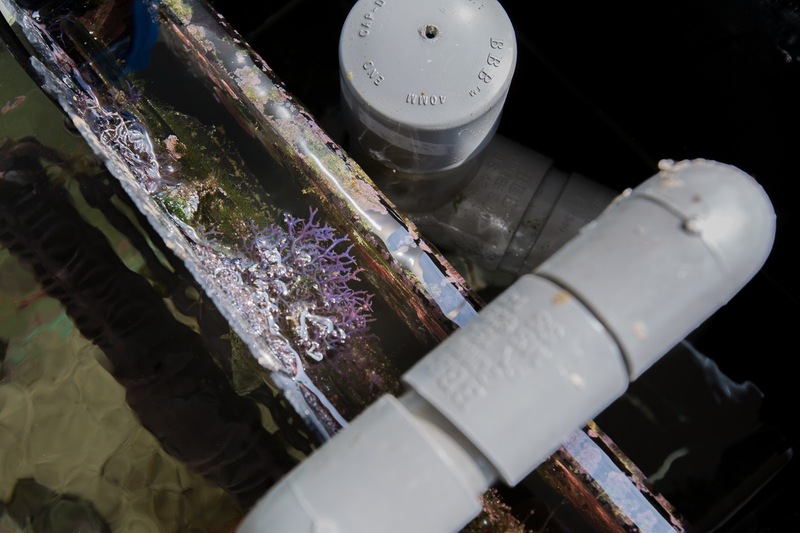 I've been wanting to do a outdoor regional marine tank for years. One of these days. Never trust a man with a castle in his tank. 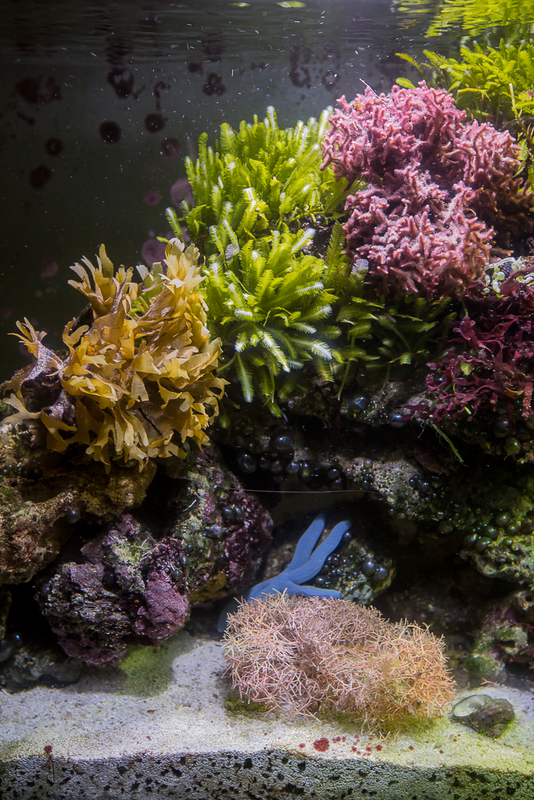 The "Halophila’s Seagrass tank" was a great inspiration to me as well. It's amazing what can be achieved with a very simple system, when plants are the dominant organisms kept. I just went back and reread the article, and I was surprised by how many fish he had in there-a lot more than in my 180! Oh yea i was just digging through RC's old archive for that thread recently too, its a goldmine to us. And he had very little gadgets. These setup are so rare and few. love it. great job. and the mandarin eating frozen HELL yeah = success. 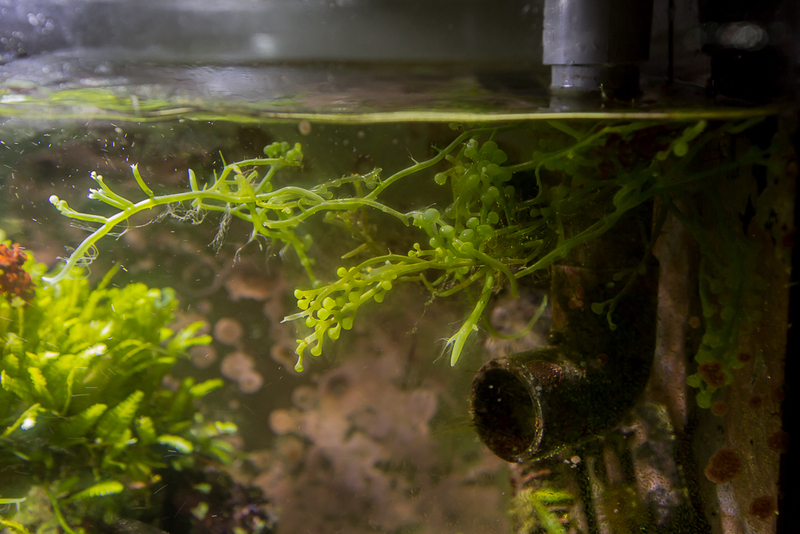 I experienced a massive die-out of the Caulerpa Serrulata probably due to lack of nutrient, I should have prune them down when i had the chance. Also lost lots of Ochtodes. I think something is feeding of them. They have been growing well in the overflow compartment now though. 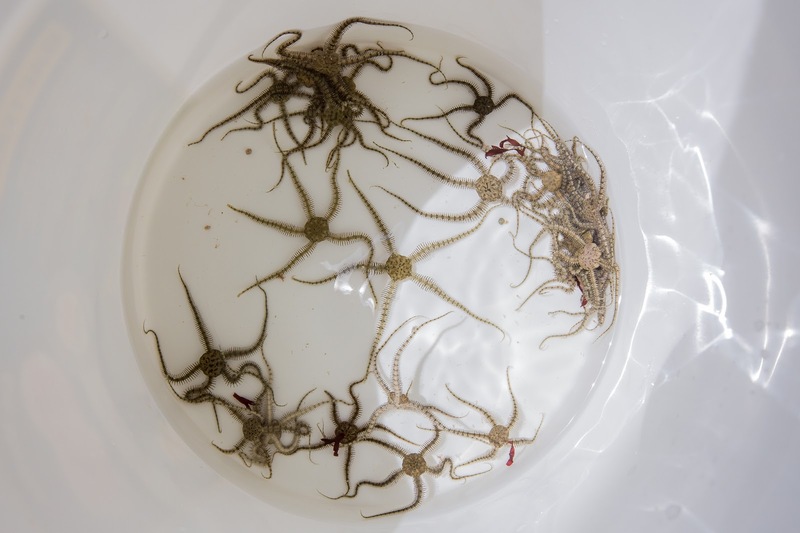 I have also harvested lots of brittle starfishes to sell to local reefers. Feeding 3 cubes of frozen food everyday helped in multiplying these thing i think! Amazing, amazing, amazing. Did I say amazing yet? Wow, amazing. 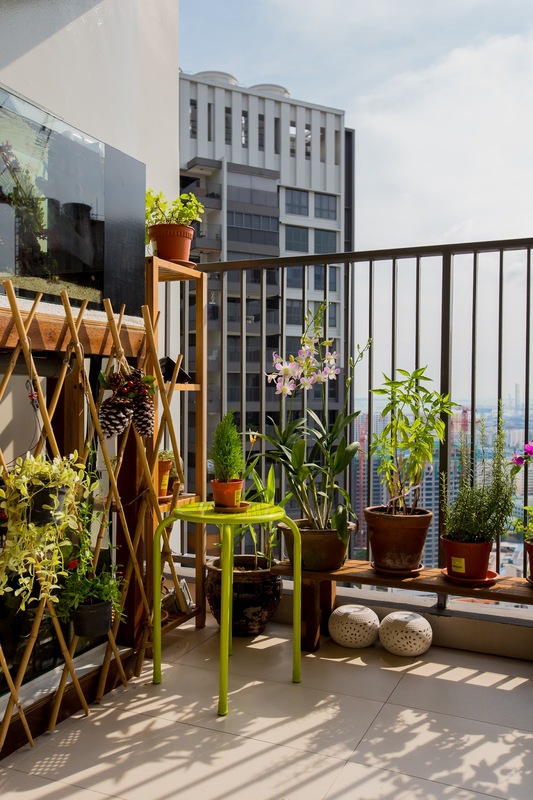 I must admit that my hands are a little sweaty imagining being on the balcony. I'm not crazy about heights..no phobia, just a healthy respect. Oh my. This! I must follow this! It's looks great! That looks great! Awesome colors! 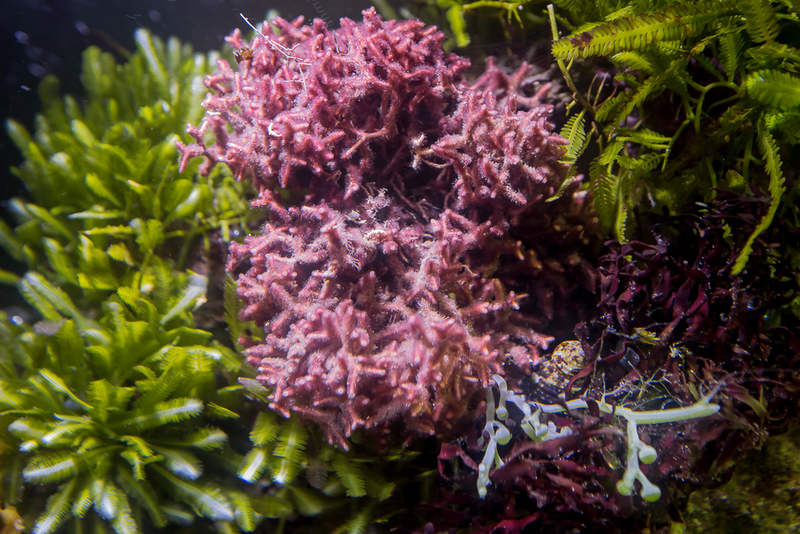 I noticed in the 'after' pic there is much less macro algae on the substrate. Is that from the die off or did you remove it? Could you post a pic with the sun on the tank? This is Wonderful. Seeing something similar to my imaginations is so great. I Salute you, fellow reefer. Hold on a second. You've been feeding 3 cubes of frozen food a day to a 40 long with no fish? Woa! Well the plants and the serpent stars seem to like it! Is there anybody else in there, like a grouper or napoleon wrasse? 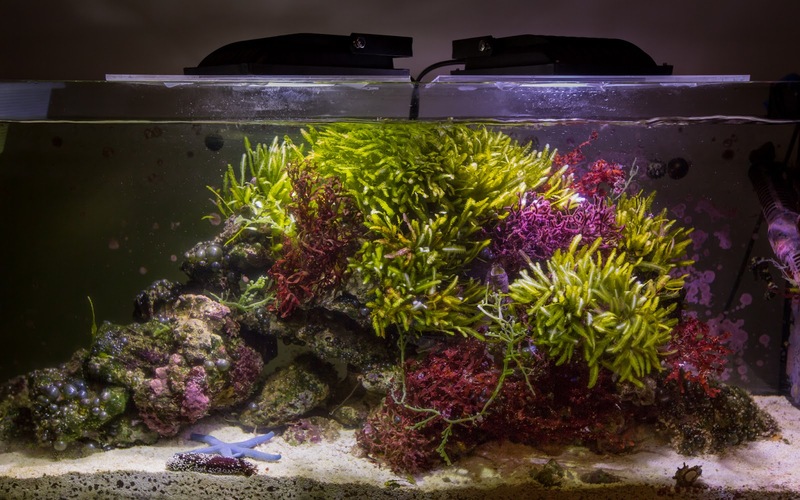 Feeding so much usually leads to an algae problem. 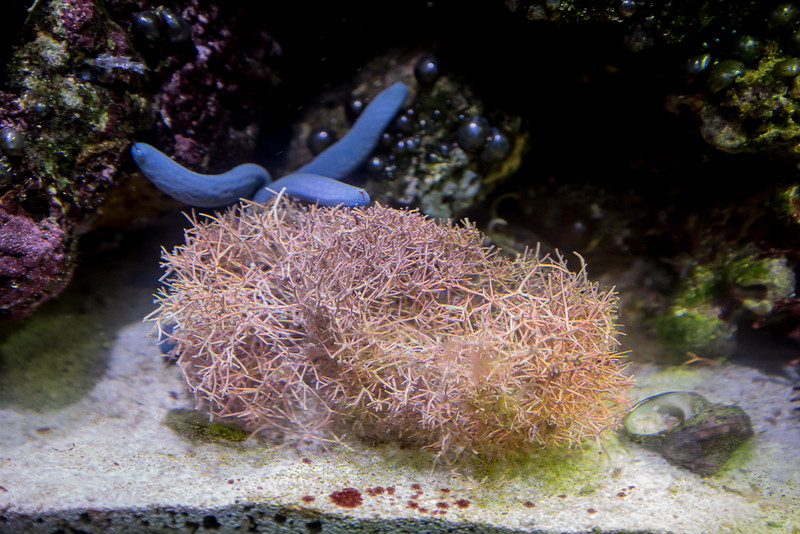 I guess you've proven that, with a healthy detrivore population and an established crop of macro algae, you can feed a ridiculous amount of food! Do you have any thoughts on how you were able to do this? Impressed! The stars were getting too much and too aggressive and they out-compete for food with the mandarin and seahorse so i had to remove them. There is an ATS in the sump and the skimmer has been turned off for 2 months already. And the readings have been like NO3 10ppm & PO4 0.025ppm. The skimmer has been turned off for 2 months already and i've still been dosing KNO3 to maintain NO3 at 10-20ppm. PO4 reads about 0.025 on the low range test kit. I've also started dosing Iodine on-top of Iron. and the photo taken in daytime as requested by Michael. Its not gonna look as nice compared to the one at night due to the reflection from the bright background. Closer up photos of the new weeds! 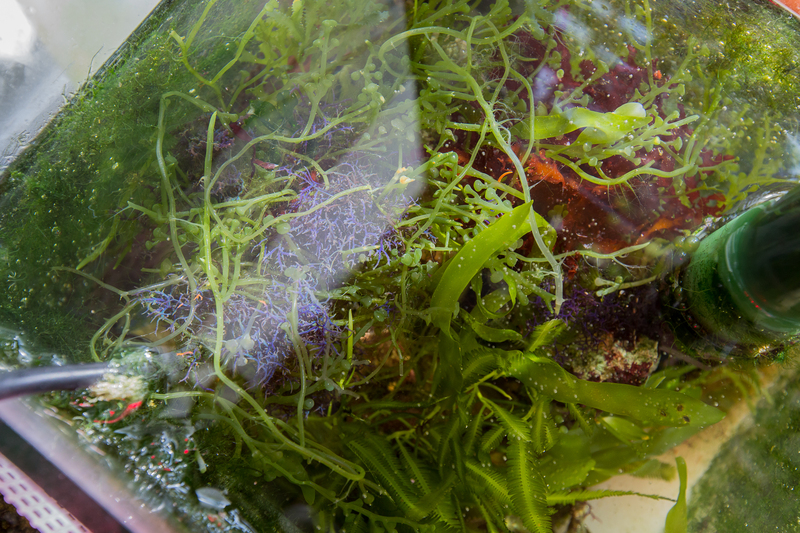 Galaxaura, i already have these in the tank, which was invaded by the Caulerpa no thanks to lazy maintenance. And an update on the Ochtodes which have been growing really well in the overflow! This spot is probably closer to 'intertidal' zone with high flow and semi-dry. I never had luck with the grapes in the display tank as the regal tang has taken a liking for this algae. 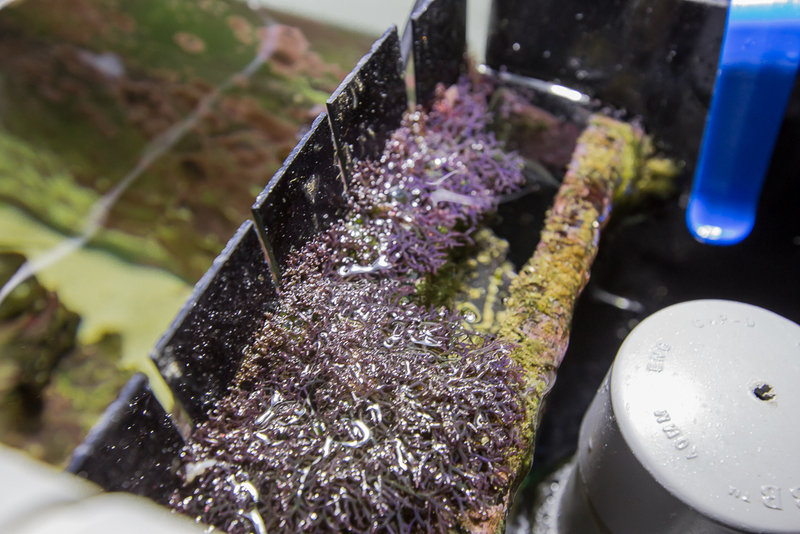 However, i've discovered that by planting it where the strong return-pump current is, the tang would leave it alone These are one of the fastest growing algae in the sump too, so the tang does get some algae treat from time to time. Last edited by cksss; 12/17/2015 at 06:24 PM. I love the looks of this tank, it's so pretty.